"The Supply had arrived the day before, and the governor, with every person that could be spared from the ship, were on shore, clearing the ground for the encampment." "as an Harbour, None, that has hitherto been described, equals it in Spaciousness and Safety. the Land forms a Number of pleasant Coves in most of which 6 or 7 Ships may lie secured to the Trees on Shore. The Whole, (in a Word) exhibits a Variety of Romantic Views, all thrown together into sweet Confusion by the careless hand of Nature." "Our passage to Port Jackson took up but few hours, and those were spent far from unpleasantly. Having passed between the capes which form its entrance, we found ourselves in a port superior, in extent and excellency, to all we had seen before. We continued to run up the harbour about four miles, in a westerly direction, enjoying the luxuriant prospect of its shores, covered with trees to the water's edge, among which many of the Indians were frequently seen, till we arrived at a small snug cove on the southern side, on whose banks the plan of our operations was destined to commence." So on the 26 January the ships of the First Fleet left Botany Bay and assembled in Sydney Cove, Phillip in the Supply having landed the day before and erected a flag pole. 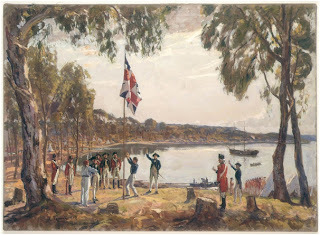 "In the evening of this day the whole of the party that came round in the Supply were assembled at the point where they had first landed in the morning, and on which a flag-staff had been purposely erected and an union jack displayed, when the marines fired several vollies; between which the governor and the officers who accompanied him drank the healths of his Majesty and the Royal Family, and success to the new colony. The day, which had been uncommonly fine, concluded with the safe arrival of the Sirius and the convoy from Botany Bay." "On the Evening of our Arrival (26th January 1788) The Governor & a Number of the Officers assembled on Shore where, they Displayed the British Flag and each Officer with a Heart, glowing with Loyalty drank his Majesty's Health and Success to the Colony." "In the evening of the 26th the colours were displayed on shore, and the Governor, with several of his principal officers and others, assembled round the flag-staff, drank the king's health, and success to the settlement, with all that display of form which on such occasions is esteemed propitious, because it enlivens the spirits, and fills the imagination with pleasing presages." Figure 3. "The Founding of Australia. By Capt. Arthur Phillip R.N. Sydney Cove, Jan. 26th 1788" / Original [oil] sketch  by Algernon Talmage R.A. Some of the First Fleet journals and letters do not even mention this little ceremony, there were only a few officers and men involved. There appear to have been no convicts on shore for this ceremony, or if they were, they didn’t rate a mention. A number of the officers were also not present nor mentioned it in their journals. Those who were not on shore or who did not mention this incident include: Worgan, White, Tench, Collins, Blackburn, Bradley and Clarke. This could indicate, to the participants, this was nothing more than a thanksgiving for their safe arrival. None of the reporters give the incident much importance, unlike the reading of Phillip's Commission on 7 February 1788. Some of the male able-bodied convicts were disembarked the next day, 27 January, and the remainder over the next few days. None of the female convicts were allowed off the ships until 6 February 1788, when the sick were also landed and admitted to the tent hospital. Therefore, in reality, on 26 January 1788 the only event was the anchoring of the ships of the First Fleet in Sydney Cove, the running up of a flag and a toast to the King and success of the colony. The official ceremony occurred on the 7 February 1788. "The 7th of February, 1788, was the memorable day which established a regular form of Government on the coast of New South Wales. On a space previously cleared, the whole colony was assembled; the military drawn up, and under arms; the convicts stationed apart; and near the person of the Governor, those who were to hold the principal offices under him. The Royal Commission was then read by Mr. D. Collins, the Judge Advocate. By this instrument Arthur Phillip was constituted and appointed Captain General and Governor in Chief in and over the territory, called New South Wales; extending from the northern cape, or extremity of the coast, called Cape York, in the latitude of ten degrees, thirty-seven minutes south, to the southern extremity of the said territory of New South Wales, or South Cape, in the latitude of forty-three degrees, thirty-nine minutes south, and of all the country inland to the westward, as far as the one hundred and thirty-fifth degree of east longitude, reckoning from the meridian of Greenwich, including all the islands adjacent in the Pacific Ocean, within the latitudes aforesaid of 10°. 37'. south, and 43°. 39'. south, and of all towns, garrisons, castles, forts, and all other fortifications, or other military works which may be hereafter erected upon the said territory, or any of the said islands." Even when the proclamation was read, it didn’t cover the entire continent, all of Western Australia and almost half of the Northern Territory and South Australia were not included. However, the territorial boundaries detailed did not give an eastern longitude, but did include all the adjacent islands in the Pacific, so could this mean it included New Zealand under Cook’s discoveries? All of the records from the First Fleet mention this incident, indicating that it was much more important to them than the little ceremony held on the 26 January. 26th. Our colours were hoisted in the redoubt, in commemoration of the day on which formal possession was taken of this cove three years before. The Queen’s birthday celebrations were a much bigger event, and this occurred a week before the 26 January. The next notable event that happened on the 26 January was the Rum Rebellion in 1808, when Governor Bligh was deposed from office by the NSW Corps. That evening Bligh had been hosting a private dinner with his friends and adherents to mark the 20th anniversary of the landing. The colony was without a legitimate government until 1810 when Lachlan Macquarie became the fifth Governor. The 26 January 1788 was not publically commemorated again until 1818, or at least there is no record found. This was the 30th anniversary and Governor Macquarie declared it a holiday, the military fired a 30-gun salute and there was a ball that evening given by Mrs Macquarie. The next reported commemoration of the date was in 1820, when a dinner was held and a song written by a Mr Robinson. 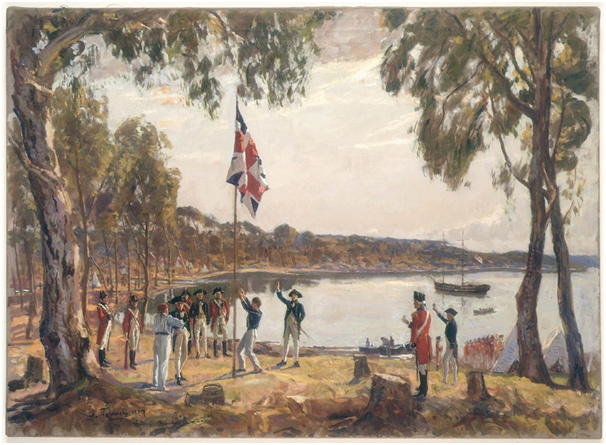 The 26th January was marked in subsequent years with the raising of the flag at Dawes Point and a salute fired, the number of guns matching the amount of years since the founding of the colony. Private dinners and occasions were held but very few of them were reported in the newspapers. 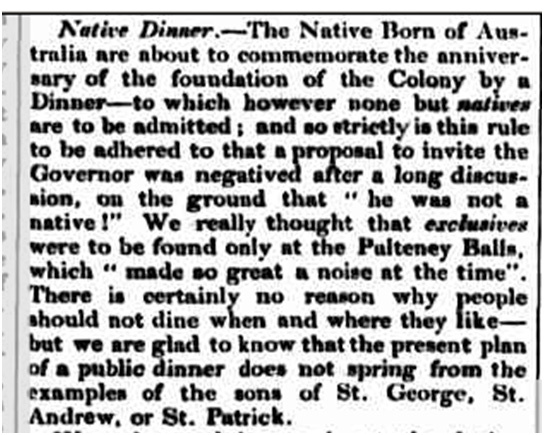 In 1837 an anniversary dinner was held that was exclusively for those born in Australia, even the Governor was excluded as “he was not a native”. Native at this time referred to European people born in the colony rather than of Aboriginal descent. 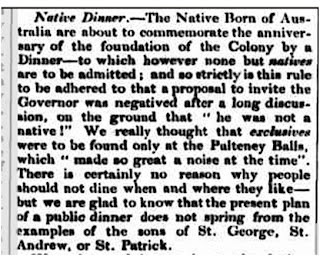 The dinner was a huge success, despite the non-attendance of the Governor and Wentworth, and the ‘United Australians’ decided that it would become an annual event. The first Sydney Regatta was also held on the day, an event that continues each Australia Day since and is now the oldest continually held regatta in the world. 2011 marked the 175th Regatta. The 26th January was celebrated first as First Landing Day, Anniversary Day or Foundation Day. The other colonies didn’t celebrate the 26th January, instead they commemorated their own foundation days; initially, the date was mainly a Sydney event. It took 49 years, until 1837, before the 26th January began to be celebrated in a form that Sydneysiders would recognise. People gathered at The Rocks and Dawes Point to watch the boat races, display the flag and have a drink, very much like what happened on the 26 January 1788, and again in 1837; although now everyone is invited, not just an exclusive few officers or the ironically self-named ‘native born’.